This is a website dedicated to the AIRPHIBIAN and the people who engineered it, built it and flew it. I told my father, Frazer Dougherty, that I was going to do a website about the AIRPHIBIAN and that I needed copies of his photos and all of the stories about how it was designed and built. I've also tried to contact the other people who were involved in its conception and implementation to get their input. If there are any errors or omissions, please let me know and I will correct them. If you have any info that you think would be useful, please send it to . The AIRPHIBIAN was conceived during World War II by Robert Edison Fulton Jr. who had previously designed and built a aerial gunnery simulator for Admiral Louis de Florez for the special devices section of the USA Navy at Sands Point, Long Island, NY. Bob had become a pilot during this period, flying a high wing monoplane back and forth from New York City and Washington DC and had discovered a niche. Somewhere and somehow during that time the first prototype of the AIRPHIBIAN. Ted Polhemus, Wayne Dasher and Franz Alverez were the technical team that worked on the aerial gunnery simulator and also built the AIRPHIBIAN prototype (see photo). It was a composite and modification of the STINSON Voyager 160 or 185 with the same wing, the same but modified fuselage, the same horizontal stabilizer, the same vertical fin, and the same engine. 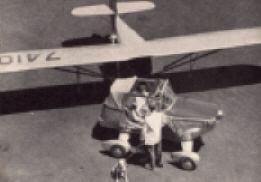 The cockpit area was modified to include a double disconnect structure for the wings and a fuel tank which replaced the back seat area. There was a new 4 wheel landing gear, and a 3 bladed propeller. I do not believe that the auto drive system was complete nor propeller disconnect. However the basic system for the quick car/plane disconnect was in place and refined later. Just before the end of WWII, Aeronautical Engineer Grover Loening gave a dinner party at his home in Locust Valley NY. The guests were Capt.& Mrs Frazer Dougherty and MM Robert Fulton. Frazer was stationed at Mitchell Field as the aide de camp and pilot for Maj Gen Frank O'Driscol Hunter, the commanding General of the 1st Air Force. Frazer had just completed a 1 year, 60 mission tour of duty with the 5th AF, 345th Group, 498th Squadron. During the evening Bob related his flying experience and the development of his auto/plane idea. After several telephone calls and letters, Frazer made the first flight of the AIRPHIBIAN off a small grass airstrip just west of Middleburg, Va. This remote, relatively unknown and unused 'strip' (although just south of route 7) was chosen due to Bob's 'secrecy' phobia. It was probably the dumbest step taken in the entire project as there was no place to go except up. It was during this session that we (Bob, Wayne, Ted and I) all met for the first time and successfully flew the AIRPHIBIAN, the first auto/plane . Franz Alverez was an engineering associate and deeply involved in all aspects of the company. Ted Polhemus was an electronic genius with a flexible talent that permitted him to be knowledgeable and useful in every aspect of engineering. Wayne Dasher was the quintessence of an aircraft and engine mechanic of the old school and probably the primary person responsible for the success of the AIRPHIBIAN. I became part of the group because of my military flying experience and was assigned to be test pilot for CAA/FAA certification. My flying experience was one of a Air Force Cadet, which was PT 19 training at Cuero, Texas, Basic Training at Randolph Field, and advanced training at Ellington Field. 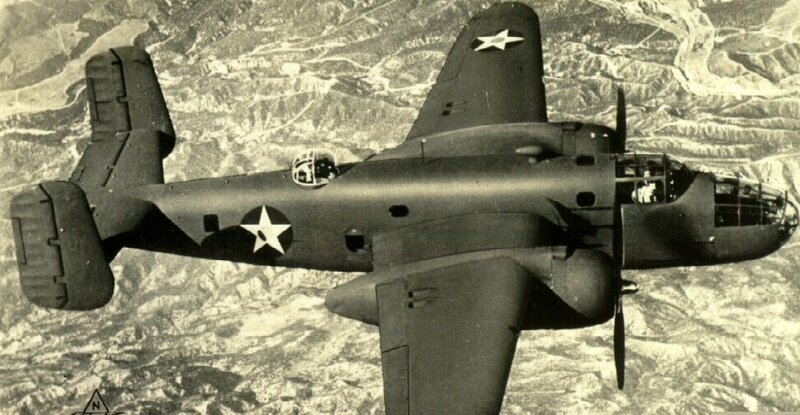 I was slated to B-25 training at Columbia S.C. and then assigned to the 345th Bomber Group, 498th Squadron. in Port Morseby and Nadzab New Guinea,(5th AF) where I flew 60 missions. The 345th BG's B-25 Sq were equipped with 14 forward firing 50 caliber machine guns, and the groups combat techniques were entirely low altitude strafing and skip bombing on targets in New Guinea, New Briton, and New Ireland. I flew primarily as Captain of the plane. After my 60 missions I was transferred to 5th AF Headquarters in Australia where I flew various missions for Hq. Officers mostly into New Guinea. Within 3 months of this assignment, I was reassigned to Mitchell Field as the aide de camp and pilot for Gen Hunter the commanding General of the 1st AF. During this year long tour of duty I flew C-60's, B-25's, and A-26's, and had a sufficient number of flights both VFR and IFR to become instrument rated. PICTURE NEEDED OF TED, FRED, ROSS OTHERS?